I pruned the plum tree today. It's nice to have flowers in this vase again, even if they aren't the most graceful-looking stems. I think that is beautiful ! I am eyeing some of mine to try and force a few branches in the house .. but then I hit the reality button and all the people here that have allergies .. so it might not be the best of ideas .. but yours are lovely ! Funny .. 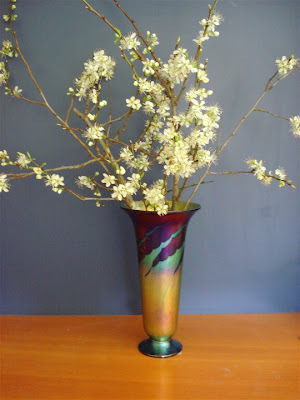 I wouldn't have thought of plum branches .. I have seen something new now : ) Thanks ! I like their somewhat irregular branches. Looks more modern arty that way. Thanks for the "other" plum and bonus goodies - it was great to see you today!